It is finally starting to feel like November outside. And while I didn't necessarily hate the 60 and even 70 degree weather, it's sweater weather and I plan to embrace that. 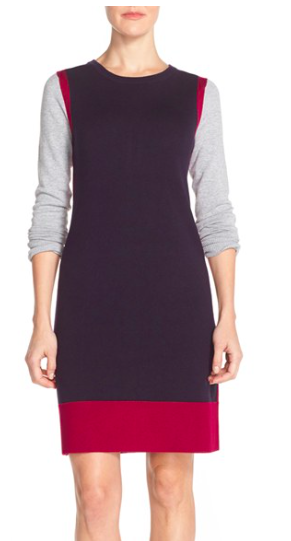 Speaking of sweater weather, it is prime sweater dress weather. Today we are looking at some lighter options with great colorblock style. A rugby inspired look that looks smashing alone or add your own style with jewelry. 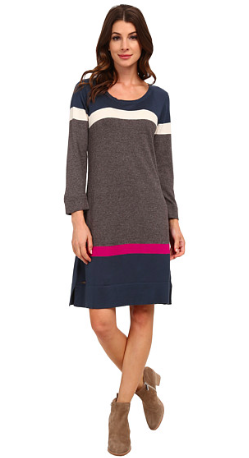 Generally when you think sweater dress, you think clingy. Not so with this relaxed fit dress. A great sale going on for a couple of days with this dress. I'd pair this with a long dainty necklace. Another more relaxed fit in a lovely shift dress. And it's 40% off. Before we break out the turtlenecks and chunky knits, I'm loving a colorful sweater dress that you can wear with boots, booties, or tights.